This is my contribution to Blue Witch's Blogichef week, where bloggers submit their quick, easy and cheap recipes. This recipe exploits the natural sweetness and nuttiness of the parsnip by roasting it before making it into soup. Prepared this way, it's hard to believe that you're actually eating a root vegetable. The sesame seeds are optional but will add to the nutty flavour. Preheat oven to 190C (mine is a fan oven - if yours isn't, you may need to set it a little higher). Peel and chop parsnips to about the size of chunky chips. I cut the fibrous middle bit out (not sure if you have to but I did anyway). Spread parsnips in a roasting tray, drizzle with a bit of oil (I used sesame and olive but it doesn't matter too much) and sprinkle with sesame seeds if required. Season with salt and pepper. Shove in the oven until soft inside and just golden on the outside. It took about 35 minutes in my oven, and I gave them a shake after 15. Remove from oven. A couple may slip into your mouth - this is fine. Call it "quality control" if questioned. Chop the onion finely. Put a knob of butter in a large saucepan and soften the onions - don't brown them, keep them moving until they're soft and transparent and just golden. Add the parsnips to the saucepan and then add vegetable stock to cover. Blend, continuing to add liquid until the soup is at the required consistency (I had to add lots more liquid than I thought and I like it thick!). Check seasoning. Serve with a nice, fresh, crusty bread. If feeling indulgent, add a swirl of cream. Suitable for freezing - that's where mine is now, otherwise you would have got a photo! Serves two if used as a main meal, but more if you have it as a starter. Cost - probably about £2 in total. A started it, by calling us "Brainiacs". "Us" being the merry band of application developers/software engineers/analyst programmers (or whatever largely meaningless label we choose to give ourselves). He then proceeded to call the project managers, who were in the meeting room at the time, "The Important People", though I should stress that this was said with tongue firmly implanted in cheek. It seemed that he had developed a system of categorisation for the department, which immediately captured my imagination in a way that the pointless task I was working on had singularly failed to. "So, what does that make *you* then?" I enquired, sensing that he had distanced himself somewhat from both previous categories. "Ahh, well I'm one of the Happy People," he announced, beaming in his usual, amiable way. "Am I *not* a Happy Person, then?" I did my very best grumpy face, lowering my eyes and ensuring that my bottom lip was protruding to the maximum, counter-productively looking as far from a happy person as is humanly possible. "Well yes, I would say you're probably a Happy Brainiac." I smiled and nodded approvingly. "I reckon he's an Important Brainiac as he's just come out of the meeting room..."
...to draw a Venn Diagram! Now, these opportunities do not come about very often, but when they do, I believe they should be fully embraced. It was in this spirit that I approached the whiteboard, pen in hand, to set about the task. Having drawn the overlapping circles and labelled them A, B and C, we then set about plotting people within the diagram. Most were easy, but we pondered for some time over G - should he go into the intersection of all three sets? In the end, we decided that whilst he was clearly an Important Brainiac, we couldn't say without a shadow of a doubt that he was a Happy, Important Brainiac. G took A into the meeting room, A emerged with board rubber in hand and, before I knew it, the diagram was gone. And with it, my smile. I continued glumly with my task. How do you know where you belong? Or should I say, how long do you stick something out before you can conclude that you just *don't* belong? I lived in Southampton for five years, but I never really considered it to be home at the time, despite owning a property there. Only now, having left, do I feel the tug of roots I didn't realise had been laid down. It's hard to feel affection for the place itself. An infrastructure bombed to buggery during the second world war and rebuilt with brutalist concrete edifices which would be fine if you could just look at them as examples and then move on to the next exhibit, rather than having to live among them and look at their oppressive greyness every day. No, what draws me there is the people, my people, the life I had when I lived there. It was a life which couldn't include Big at that time, though, which was why it was reluctantly cast aside in favour of Big's job opportunity in the West Country. Will I feel the same pull for this place when we leave? That's "when", not "if", because we don't belong here. Or maybe we will find out we do belong once we've gone. Which brings me back to my original question: I've spent so long not belonging that I'm not sure I'll recognise belonging when or if it ever comes along. What seems certain is that I belong with Big. I used to think that it didn't matter where we made our home, as long as it was together. A romantic notion, yes, but rather a naïve one. One which ignores the importance of friends and family in the equation of life. 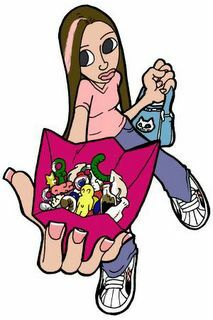 One which believes the well-meaning friends who claim that they will visit but who rarely do. One which fails to consider the fact that two people raised in two of the biggest, most cosmopolitan cities in this country may find it hard to adjust to small town life in one of the most rural regions of England. It won't happen any time soon, but we will leave this place and try again. Try again to find out where we belong. I found it quite amusing at first, and said to Big: "Ahhh, look, he's sitting in the hole, bless him..."
*It's the old hearth in the dining room which has been dug up and will be boarded over. 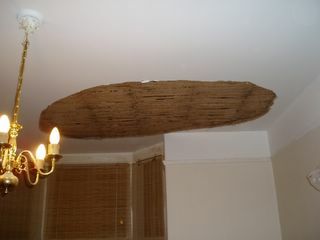 The chimney breast was obviously removed some time ago, which is a shame. This morning, whilst snoozing peacefully, I was aware of Big "exclaiming" to himself downstairs. He may even have used some swear words. This is not his usual morning behaviour, preferring to shuffle silently between bathroom, lounge and kitchen. "Love, I think you need to come down here and see this..."
Call me old fashioned, but I thought ceilings belonged, well, on the ceiling. Certainly not scattered over an almost-new cream sofa and a floor. This was especially galling because, the day before, the ceiling and walls had been freshly painted and were finally starting to look nice. And yes, I imagine these two events were related. Over the past few months, I've got the distinct impression that someone or something out there doesn't want us to live in this house. An 18 year old student waits for the London train with her boyfriend on one of the platforms of Cardiff Central station. They are eating burgers from the Wimpy just outside the station. This is the first thing she has eaten for days. For her, at this precise moment in time, the quarterpounder with cheese tastes like nectar from the gods. She hasn't been well, but all of a sudden she's better now, so much better. She's singing: "I'm coming home, I've done my time...", capering around the platform and grinning in the cold February air. The previous night, he had made a phone call. She couldn't do it, couldn't face it. "I'm going to call her. You can't go on like this. I'm calling your mum and I'm taking you home tomorrow." A shiver went down her spine at the thought of it, but she knew it had to be done. 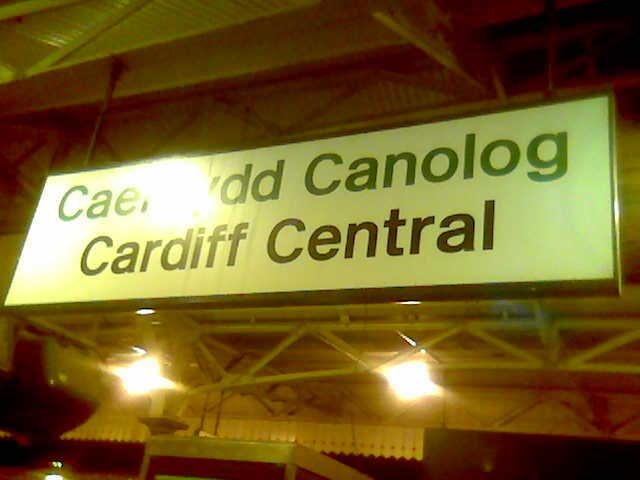 A 33 year old corporate wage slave alights from a train at Cardiff Central station. On her way out, she notes the Burger King where the Wimpy used to be. That Wimpy where she'd bought that burger which she'd eaten on that platform all those years ago. Almost exactly 15 years ago I dropped out of my university course after 5 months. I had high hopes of university life. My siblings had all had (and some were still having) a whale of a time. My expectations were clearly too high. I just didn't *get* students. The desperate attempts to be non-conformist whilst absolutely conforming to the student formula. Middle class kids playing at being poor but knowing that there was always someone to bail them out if they got into trouble. The relentless need for alcohol and the beginnings of a dependence which will follow them through their adult lives. I just didn't feel part of it, didn't understand it. Alone and bewildered, I thought there must be something wrong with me. Then I started to get ill. One thing after another. Viruses, infections, lethargy. Psychologically and physiologically, I was a mess. He was right; I couldn't go on. He took me home on that day in February and delivered me to my mum. I got myself better, I reapplied to a London university for the next academic year so that I could live at home, so that I could be a student without really *being* a student. That was the way I wanted it and it's one of the few decisions I've made in my life that I haven't regretted. Not one bit. So going back to Cardiff on Monday evening, the eve of my exam, was an interesting experience. It was there where I started my foray into higher education. And it is also there where I will hopefully have finished it. The exam felt okay. I didn't panic, my nerves were in check. I feel I produced some decent pieces of work. There were a few difficulties on each text which I dealt with as best I could, but I know the marking on these papers is very strict and rightly so. A mistranslation, in the wrong place, could have catastrophic effects. I just can't predict whether what I did will be good enough to pass. Okay, so where do I put my toothbrush? On Monday evening, I will take my suitcase full of dictionaries and other reference books and travel on a train to a city. I will stay in a hotel. I will try to sleep in the hotel. On Tuesday morning, I will take my suitcase full of dictionaries and other reference books to a place where others will assemble, with similar suitcases full of similar dictionaries and similar reference books. We will spend all day doing translations in silence. 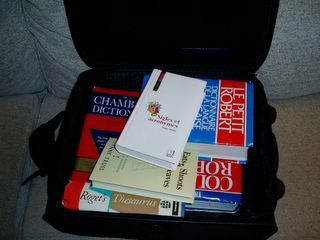 I will then take my suitcase full of dictionaries and other reference books and travel home on a train. "The thing which connects the toilet handle to the flush mechanism has just snapped. Could you see if you can get another?" This, together with a photo message which showed the broken spindle. Since I work within spitting distance of a DIY store, I popped in on my way home and picked up another flush handle assembly which was duly fitted and before long we were blessed with a fully operational flush handle once more. I thought no more of it. "Oh Anx, don't use the ladies' toilet, the handle is broken. I've told colleague B and he's going to fix it"
I furrowed my brow to myself (for what it was worth). Two broken flush handles in the space of a few days - what are the chances of that? 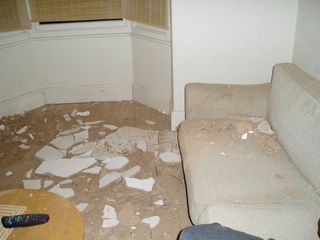 I inspected the damage. A different part of the assembly was involved with this one - the plastic thing connected to the spindle which pulls the hook attached to the syphon ("which lay in the house that Jack built....") had broken. I wandered over to colleague B's desk and colleague C was also there. They were drawing a diagram on a white board which looked suspiciously like a flush handle assembly. "Ahhh, that'll be the one in the ladies' which has broken," I nod, knowingly. "No," replied colleague C, "it's my flush handle at home. 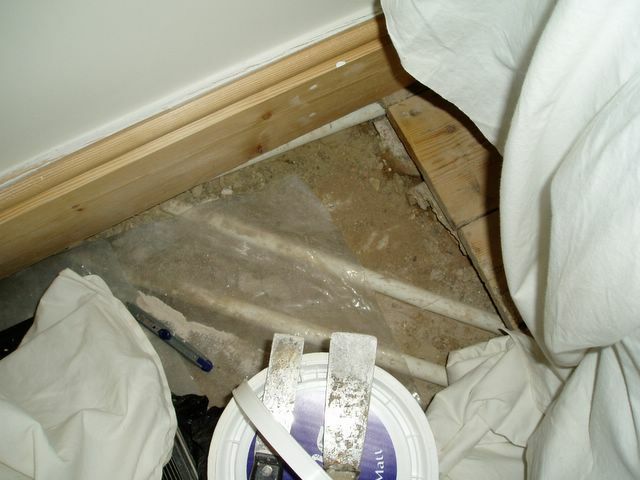 The plastic ferrule around the toilet handle which goes through the hole in the cistern has broken apart." There's obviously something in the water (closet). In preparation for my translation exam (which happens to be next week - *shudder*), I'm trying to "consume" as much French as possible. I've already subscribed to "Le Monde" and I plough through the articles whenever I have a chance to sit down (which doesn't appear to be as often as I'd like), jotting down acronyms, buzzwords, names of government officials and other interesting bits of vocabulary relevant to current affairs. I've also taken to watching TV5: a satellite channel which brings together a selection of popular programmes from a variety of Francophone countries. Unfortunately, the programme which happens to be on when I'm eating my muesli or drinking my tea in the morning is not exactly the most educational, unless your particular field of study is "Programmes which make Hollyoaks seem almost watchable". The programme to which I refer is "Un gars, une fille" ; a gem of French Canadian comedy, apparently. The jolly japes of a hapless couple with mild doses of slapstick - nah, not my kind of thing at all. I'm assuming it was you (or one of your ilk) who kindly engraved "BUM BOX" in the frost on my back windscreen at some time on Sunday morning. Unfortunately, I had to scrape off your modern art installation, due to the fact that I wouldn't have been able to see out through my rear view mirror. Sometimes I wish I were in France. It's the rules on greeting people which I sometimes wish applied here. In my experience of living in France, as a woman, whomever you are greeting, unless it's either your lover (whom you'd probably kiss on the lips) or someone extremely "important" (whatever that really means) you kiss them on the cheeks, or "faire la bise" as this phenomenon is known. Of course, depending on where you are in the country, the number of kisses will vary. In Lyon, where I lived, it was two, but some of my friends from Western France required four, others three. The key is to take your cue from the native. If they are puckering up for more, just go with the flow. New Year parties were interesting. You would arrive at the party, and then spend some considerable time kissing all other partygoers present. If any further guests arrived, you would greet them with kisses too. At midnight, convention dictated that you kiss everyone in the room, and then you would go through this whole process again when you were leaving the party. You'd learn to make allowances for the extra time spent "faire"ing those "bises", especially if you had a train or bus to catch. Even if you hadn't spoken to any of the people concerned and had spent the entire party sulking in the corner on your own, you would still "faire la bise". Simple rules. No variations here, please, we're French. There were some "rules" in France which I found frankly stifling, but this one was fine by me. It's in this country where I am a little lost. I used to kiss my mum, when she was alive. I used to kiss my grandparents, sometimes begrudgingly, when they were alive. I kiss my aunts, uncles and cousins (now that they are grown up). I kiss Big's mother, aunt and uncle. I kiss *some*, but not all, of my close friends. I'm not clear on how we've decided whether or not to kiss each other, but it's something which has evolved. I tend to "go along with" what they do. If they proffer a kiss, I will respond, but I probably wouldn't "start" it. Despite being very close to my siblings in so many ways, we don't kiss. The only exception to this was when one of my sisters was in intensive care after having had open heart surgery (she had a congenital heart condition which was only discovered at age 18; she had a heart bypass shortly afterwards). I just felt a need to kiss her as she lay there, drugged up on painkillers, wired up to the hilt and looking incredibly fragile. I don't hug them either. The only exception here being when my sisters and I stood clinging to each other at the foot of the bed where our mother was taking her last breaths. The strange thing is, I am, in the right circumstances, a very affectionate and demonstrative person. Physical contact is so important to me. Being single for a long time made me crave human touch more than almost anything else, just to share in the warmth of another human being. I wielded the CD, thinking "Hmmm, a bit of music whilst I cook. Lovely". I stuck it in the CD player, pressed the play button and bustled off. A few minutes later, I wondered why no sound was emanating from the stereo. I approached it and noted the word "Er" on the LCD. Was the stereo "er"ing on the side of caution? If so, why? I pressed play again. It whirred for a worrying amount of time. Then "Er"ed again. I took the CD out and peered at its underside. I gave it a cursory wipe and replaced it. "Er", said the stereo. I removed that CD and tried another - it worked fine. I was able to conclude that the stereo was not at fault. I gave it a quick stroke to let it know I bore it no grudge for its erring. To err is human, as they say, so why shouldn't an audio device be granted the same allowance, I asked myself. I took the disc to the laptop to see what it would make of it. It was happy to show me various videos of the artist and his entourage (it was one of those special CDs, y'see), but where were all the audio tracks? How did one access them? I tried the "backdoor" methodology - checking the folders and files on the disc. No joy. I sat there for probably half an hour, clicking here, clicking there, wondering where all the tracks had gone. "Nooooo! I don't want to see the video, I just want to listen!" I whined. "What the...?" Big knew better than to intervene and stayed silent in the front room. Then you have some idea of the machinations of my brain as it finally worked out what was going on. I'd bought the special edition CD, with a free DVD. Whilst CDs can be played in DVD players, the converse is not true. I'd been trying to play the DVD in a CD player. The audio CD was actually "hiding" in the other stereo in the loft, where it had been for six months since we moved here. Sometimes I wonder how I made it to 33 years of age.